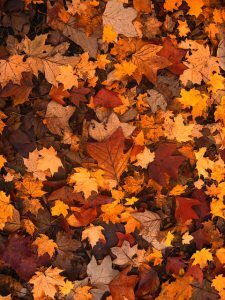 Your trees add beauty to your property, but inevitably they shed their leaves, leaving you with a mess to clean up. If you’re looking for an easy way to handle the debris, one of these best battery powered leaf blowers is exactly what you need. There are many blowers on the market – how do you know if the one you’re considering is a good one? There are a few basic things to consider when you pick out a battery powered leaf blower for yourself or a family member, so let’s take a quick look at what those are and then we’ll get to my top picks for 2019. I’m sure that when we’re done you’ll have found a blower you’ll love. If you’ve already have decided you want to go battery powered as opposed to a gas blower or corded-electric for your next leaf blower, that’s already a huge decision made. You’ve opted for convenience, less maintenance, cleaner air, easier start, quieter running noise, and more. What you do tend to lose somewhat by going with a battery powered leaf blower is 1) power and 2) length of use, which comes down to the battery operation. So, those are the main areas that you’ll need to focus on when selecting which model you want. Power refers to the CFM (cubic feet per minute) and the MPH (miles per hour) of the air that’s being pushed through the nozzle. You want that HIGH if you’re looking for a serious blower. See my full explanation on how to compare the power of various blowers. Top 3 cordless leaf blowers based on force. Click image to see review. Battery Operation and quality is often the thing that battery powered tool owners complain about the most. “It doesn’t last long enough.” If you understand battery specs, however, you’ll know what to realistically expect from the battery and charger you’re thinking of purchasing. See my full explanation on battery specs you can be an informed buyer. Top 3 cordless leaf blowers based on battery capacity. Click image to see review. Now let’s take a look at my top 10 battery powered leaf blower reviews for 2019. 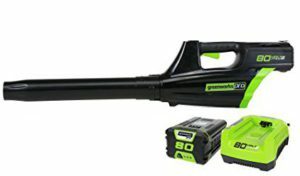 To provide a baseline for price comparison, these battery powered leaf blower reviews below all include the battery and charger. Most do have options to purchase the blower alone. Customer comments regarding the real world “battery length / running time” for all makes and models were so extremely varied that I felt this area impossible to advise upon. To read the customer comments yourself, click the “Take A Closer Look” links. This “commercial grade” cordless jet blower by Greenworks is my top pick for 2019 quite easily, as it really has it all, and for a very fair price. 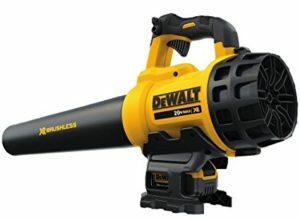 Of all of the top rated cordless blowers in our reviews here, this blower has both the highest battery capacity AND the greatest air force. It’s also lightweight and comfortable to handle. This model has the air intake on the sides, as opposed to on the back like so many models, meaning you won’t find your shirt being sucked in if you aren’t careful. There’s a stand built in underneath so you can put the blower on the ground without it tipping over. You can add a burst of Turbo power if you need some serious force! Or you can dial it up or down to whatever speed/force you’d like, and even set it to “cruise control”. It’s no “on or off” basic model – which you’ll appreciate if you have a lot of different blowing jobs to do. The front tube section is capped with a metal ring so it can better handle hitting into pavement or walls, and if you get mud or leaves stuck on it, you can just scrape it off without worrying about damaging the tube. There’s a 4 year warranty on the tool and a 2 year warranty on the battery so you can trust your investment is well protected. I really like this cordless blower and think it’s one of the best you can get. It is, however, on the higher end of the price range. If you just need a blower for some smaller jobs and don’t plan on tackling any seriously heavy work or large areas with it, you won’t need to spend the extra to own this product. 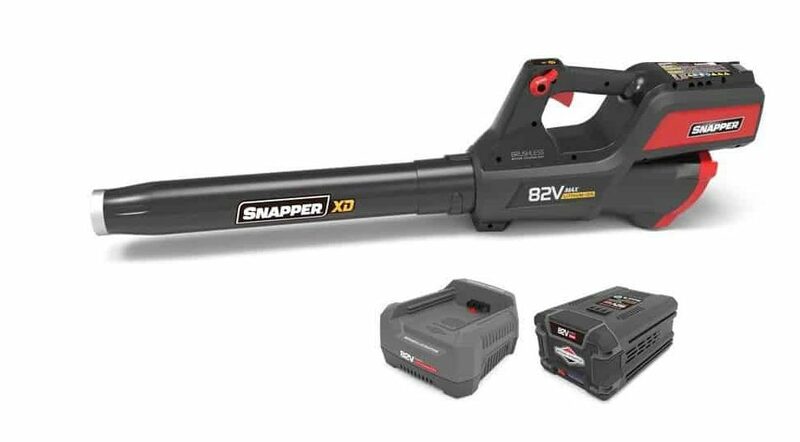 The Snapper XD blower is another of our top picks for 2019. It’s a super powerful blower and has a strong battery that will keep you working a nice long time compared to many others on the market. It also is the overall highest consumer rated cordless leaf blower in this list. It has “Infinite Speed Control” which lets YOU be in control of the air flow speed and volume. You’ll like this as you won’t always need the super high power of which this “big, beefy beast of a blower” is capable. You can set it down without worrying about damaging your investment as it’s designed with anti-tipping and stability in mind. It’s also apparently very well-balanced weight-wise when you’re working with it. The handle is over-molded and designed to be comfortable in your hand as you’re using it. 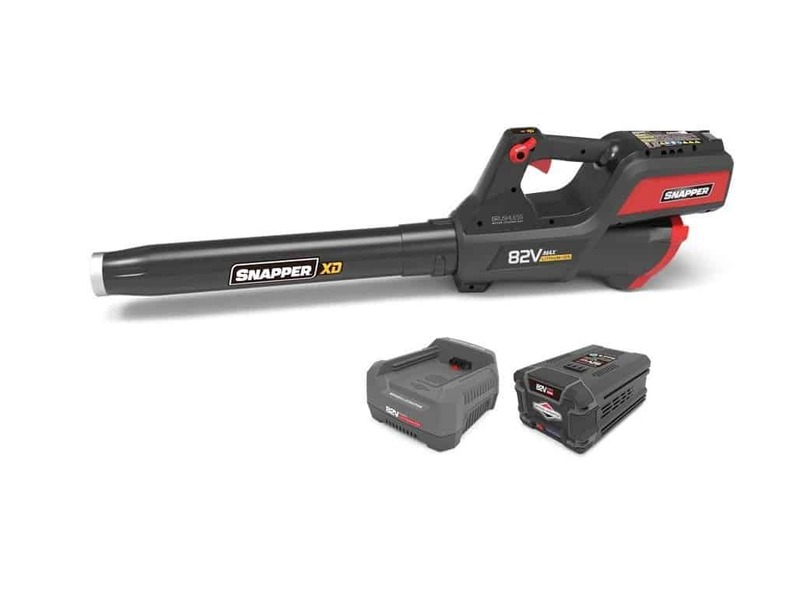 The Snapper XD blower is a professional grade cordless blower that’s packaged for the average consumer. It is powerful, easy to handle, and yes, is another blower that’s a little on the pricey side. Nothing too crazy but a little more expensive than most of the products on this list. But it’s worth every penny of its cost and I’m sure you’ll come to the same conclusion if you decide on this product. Makita is a brand name that many love and trust for all of their tool and tool-related needs. Many of you probably own one (or several) Makita products, and this particular blower is one you’ll likely want to add to your collection. This blower has overall a fantastic battery (2nd largest capacity when comparing all of the blowers in this list) and excellent air force as well. You can select from 6 different air velocity/volume selections, ranging from low to extremely strong force (customers report that it’s insanely strong, “pushes-back-your-arm” strong, able to handle wet leaves, apples, grass clippings, the entire area under your trampoline, and much more). You’ll like that can lock your selection into place so you don’t need to continually press the trigger while blowing. 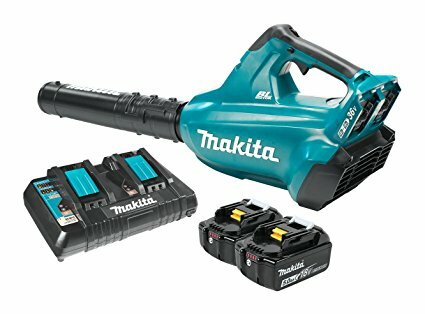 You can use the 18V batteries you possibly already have from other Makita tools – 5.0 Ah will give you the best strength, but lower (2.5 Ah, for example) can work too. It comes with a long tube and a short tube; both have adjustable settings for length and can be used independently or together to get you a really good range on the nozzle length. Unfortunately this heavy-duty Makita blower is often described in the reviews as being rather heavy in weight compared to other models. Perhaps this isn’t the model for a person of smaller frame or strength, but if that’s not a concern for you, and you’re already loving your other Makita tools, no doubt you’ll be happy with this one too. If you head over to “take a closer look” at this product (link takes you to on Amazon), be sure to check out their promotions – at time of writing, you could select an option for 2 extra free batteries, which is a pretty great deal. You may recognize the Greenworks PRO 80V product name from earlier in our list – specifically our top pick for 2019 – this here is the original model in the same line. It’s significantly cheaper than the updated version and although the changes that were made to it were really well received, if you want to save some money but still get a top quality commercial grade cordless blower, take a look at this one. It’s lightweight and has a well balanced design that makes it easily used by most individuals. You can select from 3 speed settings, which doesn’t give you total control, but you can further tailor the air flow on each through how much you depress the trigger (no trigger lock, unfortunately). The battery charger and the blower are both wall mountable, giving you the ability to keep your garage or workshop nicely organized (if you wish). It has a DigiPro digitally controlled brushless motor, which is more reliable, has less vibrations, and delivers gas equivalent performance to a 32cc gas engine. And it only needs a push-button start. There are lots of Greenworks PRO tools that use the same 80V battery, which means you may be able to find savings somewhere (either not needing to purchase the battery with the blower, or finding yourself with a handy spare that you can use for longer jobs). 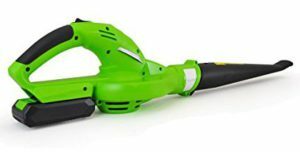 The Ego Power+ battery powered leaf blower is a product that a lot of people will love and one that anyone who does a lot of yard work should consider. It has a high efficiency brushless motor with turbine fan engineering. You’ll appreciate the quick start (even in cold weather), the lack of vibrations, long life, and the SERIOUS power you get from this motor, especially on Turbo setting. You can tackle any job with just the right power as there’s speed dial that’s simple to use, and an extra Turbo button to hold down if you need what customers describe as “gale force winds” that will “blow away anything not tied down”. Several reviewers mentioned that they recommend getting the optional blower strap that goes over your shoulder if you plan to use this on high for a longer period of time. Although at approx. 10lbs it’s still a light-weight model compared to gas blowers, you will still likely get arm fatigue as you do need to hold it slightly away from your body in order to prevent your shirt from getting sucked into the air intake. This is a high quality cordless leaf blower with a simple but very functional design. It’s not a cheap model, but I think it’s priced right for what you get. If you’re only looking for a small blower to handle lightweight tasks such as blowing off your deck, cleaning off your walkways, and such, this is the blower you should look at. If you need something heavy duty for big yards and lots of leaves, I’d skip past this option. Weighing only 5lbs (battery included), and being fairly small in size, this blower is a fantastic option for seniors who aren’t up to heavy tasks anymore, those with back issues, arthritis sufferers, and even youngsters who help out with the yardwork. 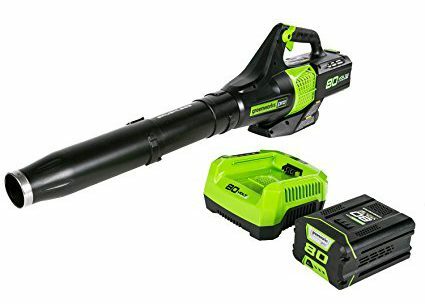 It’s the “Amazon Choice” product for “leaf blower cordless with battery and charger” – Amazon only endorses high quality products that are fairly priced and able to ship immediately. The max speed of 55 MPH isn’t an overwhelming air speed for the person carrying it (no kick back), but give it a try and you’ll notice it’s more than adequate for many smaller tasks. It comes with a detachable exhaust blower nozzle for added convenience and easy storage. 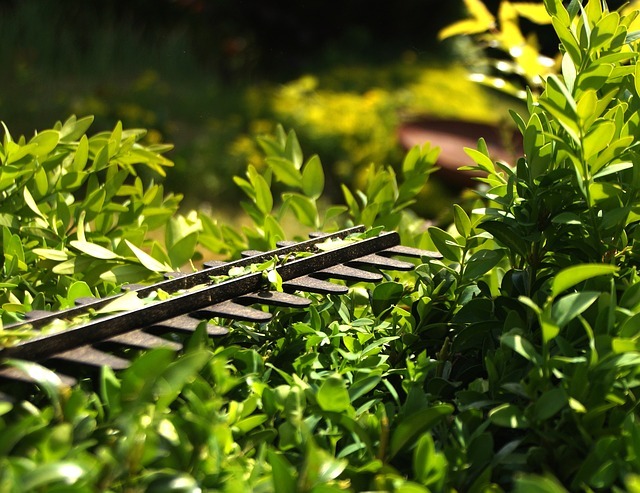 Although it’s light and fairly small, it is still a solid tool designed for outdoor use, with heavy-duty engineered ABS plastic construction. It’s really quiet, so you don’t have to worry about waking the neighbors if you want to work outside early in the day (the noise level is similar to a loud hair dryer). The smaller battery that comes with this smaller blower isn’t reported to be one with a long life, and a recharge does take approx. 4 hours. While this IS something to consider if you’re counting on using it for longer jobs, remember that this blower isn’t in the same class as the heavy duty commercial grade blowers we’re also looking at today, so expectations should be a bit different. Because this blower is so basic, it IS very affordable – the cheapest on this list. If you’re looking to save a few bucks on a blower and don’t plan on doing any intense yardwork with it anyways, the Serene-Life will work for you. This cordless leaf blower by Earthwise falls into the “light and compact” category – it’s another blower that you may wish to pass by if you’re looking for a tool with tons of power and a large battery. 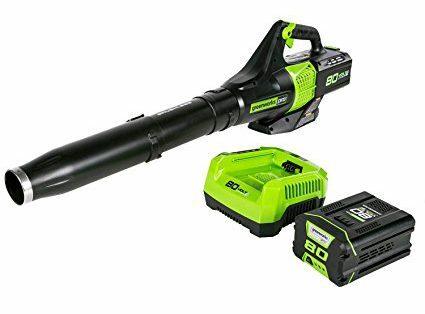 However, if you’re looking for something not too heavy and that’s easy to handle (a blower for a senior, one your children can handle, or one that won’t hurt your back to carry, for example), or if you want a more budget-friendly blower good for smaller jobs, this is definitely a worthwhile option. The tube length is adjustable, so you have a bit more control to make the air flow how you want it. It also makes it that much easier to store as you can make it quite compact. The battery has an indicator button that lets you know exactly how much battery is left, or if you need to get ready to charge it. It’s well balanced, has a comfortable rubber handle, and is easy to maneuver. It has a variable speed dial and a Turbo Boost button that will kick it up a notch if you need some extra power for a bit. 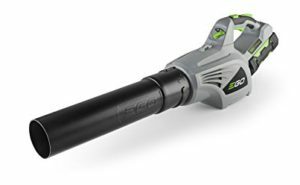 Overall, this cordless leaf blower by Earthwise is a good choice. 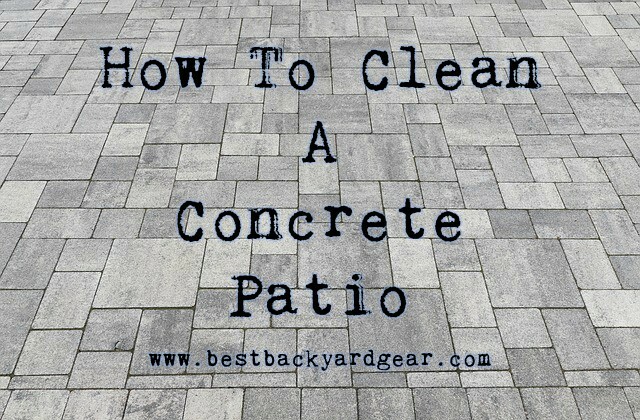 It’s a budget-friendly option, well made, has excellent reviews, and would be a handy tool to have in your garage for quick clean ups of the porch, hot tub deck, walk ways, and more. Worth a closer look. The Worx Turbine blower is one to consider if you’re looking for a mid-range blower that works well for lighter OR heavier yardwork. It’s a solid option, especially if you’re lucky enough to nab it when it goes on sale. It has a turbine fan and a “Hyper-Stream” air nozzle (tapered shape) that together let it deliver a stream of really powerful air, especially when you select Turbo! The motor is a brushless design, which means it’s high quality, long lasting, and has less friction than a standard motor. It has a wall mounting key-hole cutout for hanging on a nail or hook – you’ll appreciate being able to keep your storage area tidy. Several reviews comment on the how well it is designed ergonomically; it’s comfortable to hold, easy to use one-handed (the variable speed control dial is apparently placed in the perfect spot), and light weight. That being said, this unit is fairly priced and comes with a decent warranty (3 years on the tool, 1 year for the battery and charger). 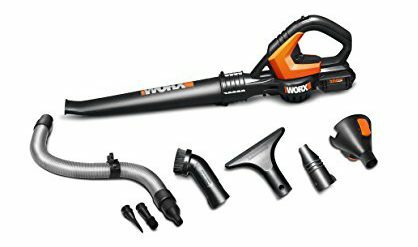 And you do get a quality product that pumps out some serious air, one from a line of tools (Worx) known to be top notch. As such, it does belong on this list of “best battery powered leaf blowers” for 2019, and is worth checking out. 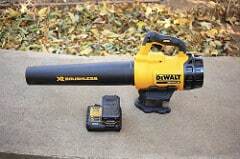 Here we have another well made and mid-range cordless leaf blower and the DeWalt 20V Brushless Blower can work for basically everyone. If you decide on this blower you’ll get a 90 day money back satisfaction guarantee (plus a 3 year warranty), so that alone is peace of mind to start off with. 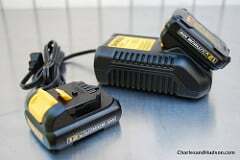 The DeWalt 20V line is a HUGE line of tools (100+), and they can all share the same 20V lithium battery. So perhaps you already have the battery (and/or a spare) and can save yourself a few bucks! It has a variable power trigger and speed lock, meaning you can free up your fingers once you’ve found the perfect setting for your job. You can press the trigger further if you need an extra burst of power, and then it’ll return to your set speed. The blower tube is wider and shorter than most others – some people like this as it pushes a wide column of air at your target, but some do comment that they prefer the stronger stream of air that a narrower nozzle would make for finickier jobs. There’s a stand designed underneath that lets you set the blower down in an upright position and not worry about it tipping over. It’s light weight and well balanced with the battery underneath, so you’ll find it minimizes stress on your arm during usage. This last cordless leaf blower on our list is one of the more interesting options, as it’s really a multi-purpose cordless yard tool. It’s not a heavy duty blower that can handle big piles of wet leaves, but it can sure come in handy for blowing off sidewalks, decks, patios or porches, for cleaning out workshops, blowing debris off gardens, and more. It comes with 8 Attachments: long tube, short tube, dust brush, detail brush, extension hose, dust nozzle, wand or wide nozzle, inflator nozzle. AND a bonus deflator attachment! You can also choose to purchase it with a 20V battery, which means less running time, but this may be a great option if you’re looking to save a few bucks OR have another tool in the Worx 20V line that can share batteries. Because it’s tiny and ultra-lightweight (3.8lbs), and yet can do so much, you’ll can take this blower everywhere. It’s perfect for packing in the RV or boat, for using to inflate or deflate rafts, mattresses, and water toys, and so much more! This lightweight blower/multi-purpose tool is something you’ll love having close at hand for small clean up jobs. 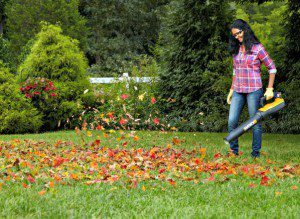 It’s really affordable and simple to use – a great buy for anyone… unless you have a huge tree that drops all of its leaves at once and you need a blower to clean that up. If that’s your need, I’d pass on this one. If you want a simple clean up tool though, this is a great choice. Now that we’ve covered the reviews, before you make your final choice, you may be interested in making sure you did pick the best. As promised, here’s an explanation for you on how to spot a battery-powered leaf blower that has good power and a quality battery. It’s not overly technical, don’t worry. The CFM: CFM stands for cubic feet per minute, and it tells you how much air flow the device can deliver at maximum power, how much air is being pushed through the nozzle per minute. The MPH: MPH stands for miles per hour, and this number tells you the speed at which that air is being moved. Putting the two numbers together, you’ll be able to compare how much FORCE the leaf blowers you’re considering have. This is the regarding of the battery that comes with the leaf blowers – the strength and capacity it has to work continuously during your job. Unfortunately there’s no way to predict exactly how long a particular battery will last for your leaf blowing tasks on a daily basis. This is because it’s dependant on the strength of force you’re running it on that day. Full force = shorter battery life. Low force = longer battery life. On a yard heavy with fallen leaves, you may need a fair bit of battery juice to get the job done, regardless the power setting you choose. Most people find that on a decent size yard, they either need a spare to swap out, a really powerful battery to start with, or a break time while it recharges. This is normal, unfortunately. The best battery powered leaf blowers all use rechargeable batteries, and you’ll see 2 numbers listed in the product descriptions below. These help you know its capabilities under perfect conditions. They are Ah (Amphere Hours) and V (Voltage). Really simplifying things, the Ah is the amount of amperage/current that the battery can deliver (based on 1 hour). 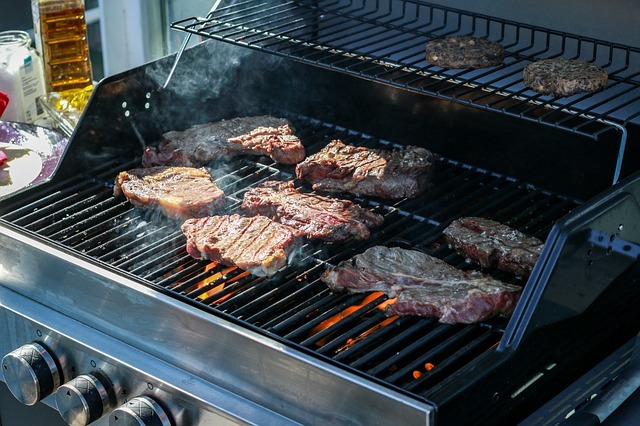 A higher number means a higher energy charge… a good thing. Voltage can be described as the power that pushes the current through the battery. Again, the higher the “better”. (See more on this here). In this example, you can see how Battery B has a significantly higher energy capacity than Battery A. This means that you can in theory expect Battery B to run the leaf blower for almost 4x as long as Battery A, OR that Battery B could run a leaf blower 4x as strong as Battery A for the same length of time. No matter your budget or needs, there was hopefully a cordless blower in the list above that fit exactly what you were looking for. They are all good quality blowers, highly rated by many happy customers, and I think you’ll be happy too with any of them. Whichever you choose, I hope you enjoy working with your cordless leaf blower this season and that it makes your job a whole lot easier and quicker! 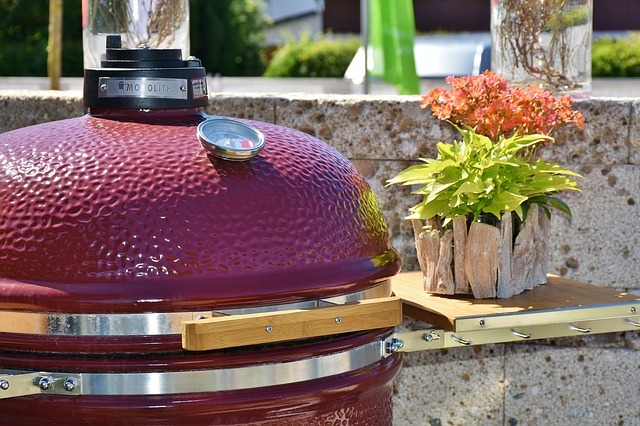 Whether you’re tackling spring or fall clean up, blowing out chicken coops or rabbit hutches, or just dusting out the garage or patio, you’ll love having one. As always, if you have any questions or feedback, let me know in the comments below and I’ll get back to you quickly. If you still aren’t sure if a battery powered blower is right for your needs, check out this Consumer Reports buying guide video to see what your other options are. It’s a few years old, but it’s still a worthwhile watch. I was looking for content on the best commercial back pack blowers when I stumbled on your article about leaf blowers here. Good stuff! 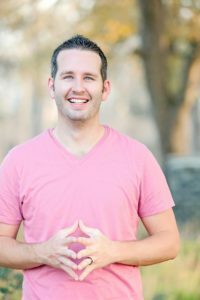 You guys have one of the most comprehensive lists I have seen on the subject. Thanks so much Gene! I appreciate the feedback. Wishing you all the best too! Hi Walter, Thanks for the encouraging note! Glad you found a blower that you’re happy with, and wishing you many awesome gardening sessions with your Dewalt! Cheers!